SpillFix instantly absorbs hazardous liquid spills, including oil, solvents, paints, and chemicals, on contact. Traditional absorbents just blot spills, meaning floors remain slippery and take hours to dry. 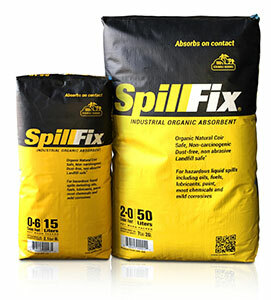 SpillFix is dust free, chemical free, and non-carcinogenic. Some absorbents release dust and carcinogenic crystalline silica into the air, creating a hazardous breathing environment; SpillFix is 100 percent environmentally safe. 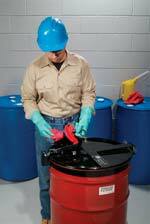 Workers can use SpillFix to remove oil and hazardous liquids from their hands and tools. The Scott Safety Air-Pak 75i SCBA is a NIOSH-approved SCBA designed with durability, dependability and user-focus in mind. The Air-Pak 75i SCBA features Scott’s unique dualredundant pressure reducer coupled with the innovative and patented Scott Vibralert end-of-service indicator to provide dependable, peace-of mind protection even in the most demanding industrial applications. Airborne toxins present an immediate danger to the health of a workforce. Dräger PARAT® Escape hoods are designed to be easily donned and protect users from toxic industrial and fire-related gases, vapors and particles for at least 15 minutes. 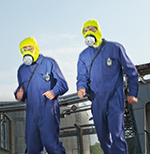 Filter options for the Parat portfolio make the benefits of an escape hood available for a wider range of applications: Parat 4900 with NIOSH filter, Parat 5500 with EN CO filter, and Parat 7500 with EN combination fire and multigas filter, ideal for escape from fire and toxic industrial gases, vapors and particulates. OSHA’s Hazard Communication standard recently has been enhanced with the Globally Harmonized System of Classification and Labeling of Chemicals (GHS). This new standard not only gives workers the right to know the chemicals and hazards they face, but the right to understand them and how to protect themselves from damage. 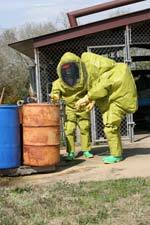 DuPont Sustainable Solutions’ new HazCom: In Sync with GHS will help employees understand this new standardized process of communicating chemical hazards. 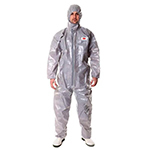 Saint-Gobain Performance Plastics' ONESuit® line of protective single-skin hazmat suits are certified to the National Fire Protection Association (NFPA) 1991 standard for protection against the most dangerous chemical and biological agents. The single-skin design of ONESuit products allows for maneuverability and user comfort while offering flame-resistance, extended shelf life, and more.